The Bonnet Rouge Rafting will make you live an extraordinary day packed with adrenaline and crazy fun! You will be entitled to exhilarating descents with a dynamic, courteous and professional team. We also offer a wide range of services and fun activities to make your stay with us a memorable one. 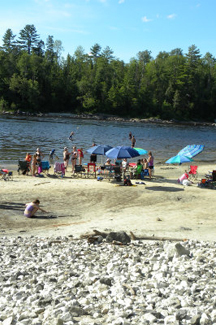 Also a beautiful tailored to the needs of its customers, the campground has plenty of space allowing you to enjoy a host of activities such as beach volleyball, badminton, bocce, croquet and such to relax with family or friends. Note that the site is bathed in an exceptional natural environment that lends itself nicely to hiking. The site has well-maintained dry toilets, picnic tables and places for campfires. Shuttle service available We have at your disposal a little canteen annexed to an outdoors dining for your small cravings.